This story of true love – and loss – will break your heart. Have you ever made a marriage pact with someone? The sort of pact where you and someone agree that if you reach a specific age and neither of you is married to someone else you’ll marry each other? On website Imgur.com Alex Clifford moved many people when he told his story of a marriage pact he made with his best friend more than 10 years ago. They agreed that when she was 30 and he was 32 and they were both unmarried they'd marry each other. But no one could have predicted the end of their love story. They agreed that a committed relationship between them would be an all-or-nothing kind of thing. Because at that stage they didn’t want to be in a serious relationship or give up their “irresponsible” lifestyle, they decided to remain only friends. Both were dead on arrival at the hospital. Alex’s friend moved back home to take care of him. For two years after the accident she broke contact with all her friends, including Alex. When he saw her again she was different. Before the accident she’d been the happiest, most positive person Alex had ever met. After she came back she was quieter, sadder and perhaps wiser. Alex told his friend he was in love with her and that he wanted to be with her. She told him she couldn’t handle the idea of any emotional connection for a while. She said she needed time. Maybe a few years. She needed to figure out what it meant to be alive in a world where her sisters were gone. Then the couple made a marriage pact. Alex was 25 and she was 23. With the pact made Alex and his best friend went their separate ways. She moved to Wyoming to be alone and Alex went to Germany to be as far away from her as possible. During the following years they gradually began to correspond. Sometimes they’d post each other books each thought the other would like. In this way they became closer. 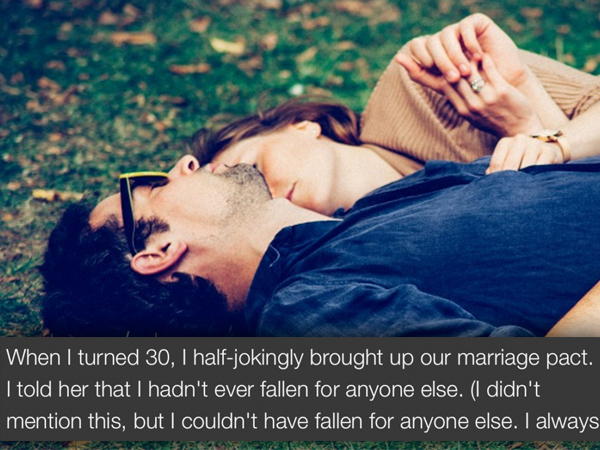 “When I turned 30 I half-jokingly brought up our marriage pact,” Alex says. “I told her I hadn’t ever fallen for anyone else. I’d compared every other woman to her and in my memory she was perfect. They decided to meet and spend time together to see if the spark was still there. Meanwhile Alex celebrated his 32nd birthday. He proposed to her six months later but she said they had to wait another few months for her to turn 30. But Alex couldn't have been more wrong. “She died. That’s how the story ends. She was hit by a drunk driver and spent two days in intensive care before her body gave out. I went to her funeral and spoke to her father but I barely remember what we said. I’ve never spoken to him since. I don’t have the will power to make myself find out how he’s doing." That was four years ago. “I’m in therapy and trying to learn how to have feelings again other than blank, mindless, miserable rage. I often wonder if this is what it felt like for her. She made progress. She learnt to feel again. That thought is what keeps me going. She did it. She’d want me to do it. “That’s it. That’s the story. It’s a s**tty story and I hate it.” Do you have a heartrending story to share? Email it to web@you.co.za, or upload it here.